Android is really turning into a jack of all trades, having become the OS of choice for phones, tablets, face computers, and now wristwatches. The combination of flexibility, open source code, and low cost of entry make it a prime candidate for countless utilitarian purposes. With the upcoming release of Android L, Google is aiming to make it even easier to deploy highly specialized environments with a new feature called Task Locking that allows a single app to take control of the interface and prevent users from switching apps or even seeing notifications. Task Locking isn't intended for use on average consumer-oriented phones or tablets. Instead, it requires a device running a custom build of Android, making it more practical for use in businesses or other large institutions. The operating system must be configured to grant special rights to a single, pre-selected application which will be able to activate and deactivate the locking mode as needed. When the system is locked, all notifications and status info are hidden, along with the Home and Recents buttons. Until the locking mode is shut off, only the selected application is allowed to start new activities (change screens), which is intended to prevent other apps from interfering with the intended behavior. By introducing Task Locking, Google is setting up Android to become a contender in quite a few markets. 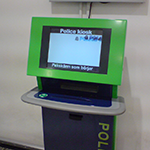 The most immediate position for this feature will be in self-service kiosks, a market that has long been dominated by a special variant of Microsoft Windows. Educational institutions will likely put this functionality to work for SAT testing and in other licensing exams, particularly in the medical and legal field. Corporations may also adopt Task Locking as a way to turn general purpose devices into more specialized tools without sacrificing the other advantages of an open and flexible platform. In a few years, there's a good chance many of us won't even notice that we're using Android to check in at the airport or to take a test in school. What will matter is that all of these systems are built with a robust platform that can be maintained and upgraded easily. Ultimately, this will shift a lot of attention to developing software and reduce the need for custom-built hardware, and that should contribute to lowering costs and improving quality across the board. Hey, even though we may not always see it happening, things like this can make a big difference.